Ciara also gained the �Beaver of the Year� in 2009 whilst she was a Lodge Leader, so Ciara keenness and dedication to Scouting is still as strong. Well done Ciara. 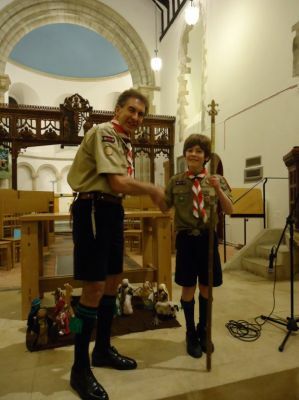 For Year 2014 the 'Wolf Cub of the Year' was awarded to Sixer Lucas from Woodcote who gained the most points for his regular attendance and support at Wolf Cub events and activities, camps and Church Parades; 'Bob-A-Job' and his great efforts in assisting the Scouts with the clearing and clean up of Streatley Church graveyard. Well done Lucas. For Year 2014 the 'Beaver of the Year' was awarded to Lodge Leader Jack from Goring who set an outstanding example to the other Beavers, for his regular attendance and support at Beaver meetings, events and activities, Church Parades and 'Bob-A-Job'. Well done Jack. For Year 2014 the �Scout Patrol of the Year� was again awarded to Falcon Patrol led by Patrol Leader Dominic gaining 161 points, second were Panther Patrol with 160 points, third were the Senior Scout Vane Patrol with 159 points and lastly Lion Patrol with 155 points. 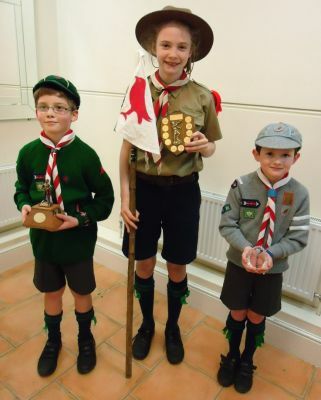 The photograph shows Scout Ciara, Wolf Cub Lucas and Beaver Jack holding the trophies that were awarded at the Scout Group Christmas Bash our annual Christmas Party of fun and games attended by all the Scout Group members, parents, family and friends. This Year 2012 the 'Scout of the Year' 'Stave Award' was awarded to Patrol Seconder Sebastian who gained most points throughout the year for his support at Scouting events and activities; attending the monthly Church Parades; passing Scout training programme tests and badges; raising considerable funds for the Scout Group through 'Bob-A-Job' during which he raised �132 (obviously a record earnings for a Scout and beating the previous record of �77.00 held by Max) by advertising the services that he could offer, organising the jobs and ensuring that they were all carried out to the best of his ability ‘Jobs Well Done’ ; along with other fund raising activities; and for generally setting an excellent Scout standard for the other Scouts to follow within the Scout Troop. Winner : Patrol Seconder Sebastian scored 104 points. 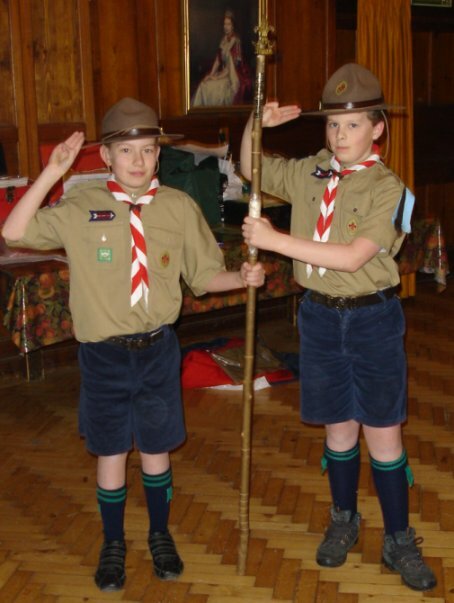 Second Joint : Senior Scouts & Patrol Leaders Robbie and Jack drew with 100 points. Third : Patrol Leader Abigail scoring 96 points. Forth : Patrol Seconder Dominic 92 points. Well done to Wolf Cub Senior Sixer Max who gained most points throughout 2012 to become 'Wolf Cub of the Year 2012'. Max has given good supports for all the Wolf Cub and Scout Group activities and events, as well as regular attendance at our weekly meetings, monthly Church Parades and of course progress in his Wolf Cub Star training tests and towards his 'Leaping Wolf' badge. Following stiff competition amongst the Scouts for this prestigious award throughout the year, which is competed for by regular attendance and support for the Scout Troop, Church Parade attendance, badges earned, camping skills, Bob-A-Job and other fund raising, etc., this year's Scout Max Helmschrott-Bowden with 90 points was awarded the ‘Scout of the Year Stave’ by the Group Scout Master David Cooksley. Second highest points gained being Patrol Seconder Jack with 89 points, and third Scout Dominic Perry-Brewer with 87 points - a very close run thing. Max’s name has now been engraved on the stave along with the Scouts previous gaining the award. Well done to Wolf Cub Sixer Ethan, pictured receiving his prize from Akela. 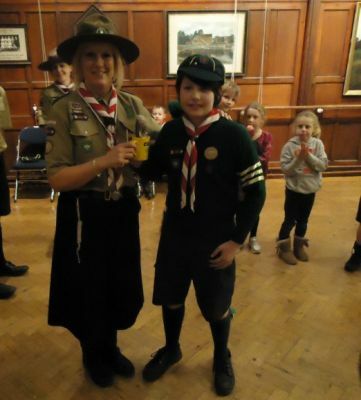 Ethan gained most points throughout 2010, by supporting the Wolf Cub Pack camps, activities and parades; tests and badges passed and his great effort during Bob-A-Job earning �50.50 carrying out 18 jobs for 14 different households in Goring and Streatley. There is always great competition between the Wolf Cubs to be Wolf Cub of the Year, so Well Done Ethan. The Wolf Cub Six of the Year was Yellow Six, Sixer Felix Warren and Second Harry were presented with the Wolf Cub Six of the Year trophy 'The Gold Wolf' with the Yellow Six colours attached. Well done to all the Wolf Cubs in Yellow Six. 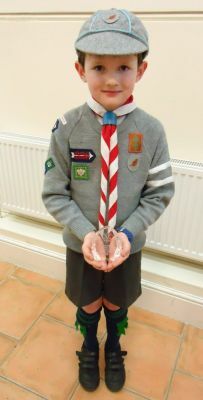 Well done to Beaver Lodge Leader William winner of the Beaver of the Year 2010 Competition. 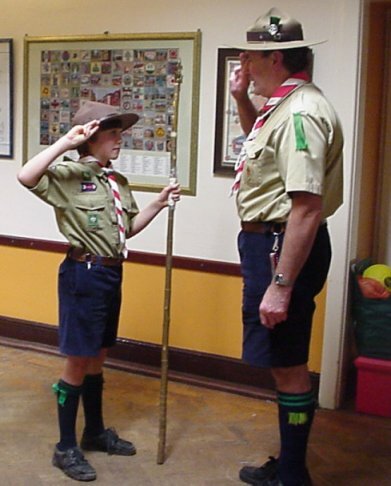 William gained most points throughout 2010, by supporting Beaver activities and parades; tests and badges passed and his great effort during Bob-A-Job earning �15.00, carrying out 6 jobs for 5 different households in Goring. There is always great competition between the Beavers to be Beaver of the Year, so Well Done William. William has gained all the Beaver badges including the 'Swimming Up' badge and will now be moving up into our Wolf Cub Pack, where he can wear the top award Beaver 'Swimming Up' badge on his Wolf Cub uniform. This Year 2009 the 'Scout of the Year' was awarded to PL Gareth who gained most points throughout the year for his support at Scouting events and activities (including organising and leading his own Patrol Camps); attending the monthly Church Parades; raising considerable funds for the Scout Group through 'Bob-A-Job' and other fund raising activities; and for generally setting an excellent Scout standard for the other Scouts to follow within the Scout Troop. The photograph shows Gareth being presented with the 'Scout of the Year Stave' and also Gareth was promoted 'Troop Leader' the first Scout for many years that has reached the standard to be awarded the rank of a Troop Leader. Very Well Done Gareth. 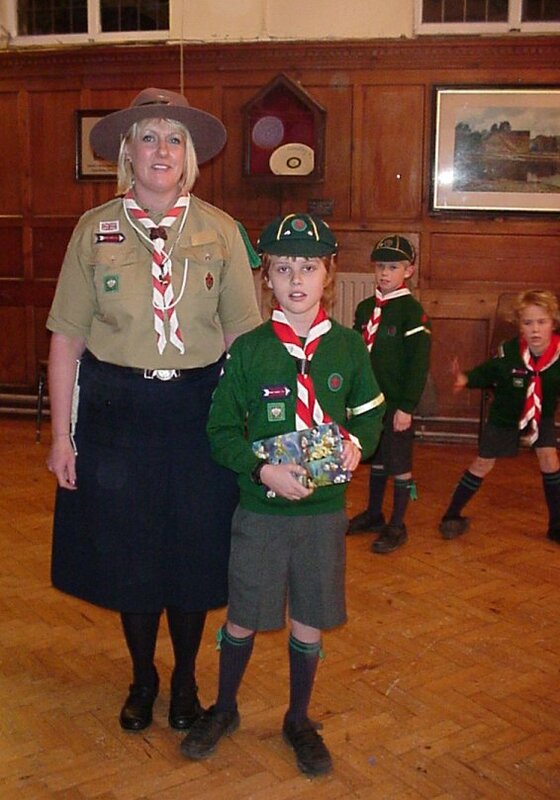 Wolf Cub of the Year ~ This Year 2009 the 'Wolf Cub of the Year' was awarded to Sixer Max who gained the most points for his attendance and support at Wolf Cub events, activities, camps and Church Parades; raising an incredible �44.55 towards the Scout Group funds during 'Bob-A-Job'. Well Done Max. Beaver of the Year ~ This Year 2009 the 'Beaver of the Year' was awarded to well deserved Lodge Leader Ciara who set an outstanding example to the other Beavers, for most of the year she has been the only girl in the Beaver Colony, joining in all activities and giving great competition and challenge to all the boys. Well Done Ciara. Ciara who has passed the 'Swimming Up' Badge will now be joining the Wolf Cubs when the new meetings start in the New Year which she is great looking forward to. Beaver of the Year: Lodge Leader Jennah B.
Wolf Cub of the Year: Sixer David M.